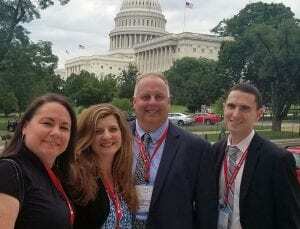 South Orangetown Middle School Interim Principal Chad Corey, School Support/Dean Michael Ryan and teachers Debra DiTuri and Christa Loughran traveled to Washington, DC, to represent SOMS at the National Forum 2018 Schools to Watch Conference, June 27-29. SOMS was one of 90 high-performing middle-grades schools across the U.S. celebrated for earning redesignation this year. In addition to accepting the Schools to Watch redesignation plaque, the team delivered a presentation at the conference, “It Takes a Team! Ideas to Develop a School Culture and Program to Support All Students,” which focused on learning structures and tools to support the development of a respectful and developmentally-responsive school culture. During their time in the nation’s capital, the SOMS team also met with a legislative aide from Congresswoman Nita Lowey’s office to discuss several issues, including the need for increased funding for mental health services in Rockland County.